Episode 13: "The Circle of Fear"
Emil van Boorman, a renowned Dutch diamond cutter, telephones Mr. Greer, telling him that he cannot cut the large diamond that he was asked to work on. He informs Greer that he will have to find someone else to do the job. Suddenly, while still on the phone, van Boorman is clubbed unconscious from behind by an unseen attacker, and the diamond is stolen. 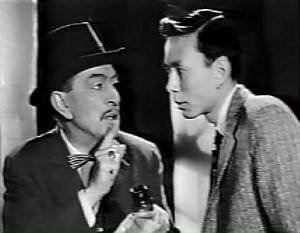 Charlie Chan and son, Barry, in London as Chan is scheduled to speak before an international gathering of police chiefs, are called on by Greer to recover the stolen diamond. The diamond that van Boorman was supposed to cut was the largest stone found in Nigeria in fifty years and was destined to become a part of the crown collection. Greer notes that van Boorman had taken an excessive length of time - five weeks - before attempting to cut the diamond. At Scotland Yard, Chan and Barry meet with Inspector Duff and Franz Weber, van Boorman's houseman. Weber states that upon returning to van Boorman's home the previous night he saw a man, identified as Bert Conway, a notorious character, flee from the residence. Weber then found Mr. van Boorman lying unconscious on the floor and the diamond missing. According to Duff, Mrs. Van Boorman had also seen and identified the thief. As Chan visits Conway in his jail cell, the furious prisoner accuses Weber of framing him, admitting that he had visited van Boorman’s home in the past in order to collect on bets made by Weber. Conway vows that he will get even with Weber. Visiting the van Boorman home, Chan and Barry meet Kirk Colton, van Boorman’s step-son, currently on vacation from his college in Amsterdam. He asks Chan to go easy on his mother as she is very nervous with all the current goings-on. Chan finds Mrs. van Boorman under the zealously protective care of Dr. George Laird. Mrs. Van Boorman confirms to Chan that she saw a figure fleeing in the dark, and that she is almost certain that she correctly identified the man as Conway. She notes that her son from a previous marriage had preferred to study in Amsterdam rather than at a local college. She also states that Weber and her husband have been friends since their days in Holland. Mrs. Van Boorman explains that it had taken her husband so long to cut the diamond due to a nervous condition that was being treated, though unsuccessfully thus far, by Dr. Laird. Searching the house for clues, Chan finds a note containing international airline flight information and a bottle of pills prescribed for Mr. van Boorman. At the office of Dr. Laird, Chan and Barry find the doctor to be very uncooperative after stating that he had prescribed tranquillizers for Mr. van Boorman to calm his nerves. Ordered out of the office, Chan heads to Scotland Yard while Barry, on his own, sneaks back into Laird's office, finding the original prescription for van Boorman. Suddenly, Barry is discovered by Laird who holds him at gunpoint while calling Scotland Yard and reaching Chan after Barry tells him that his father had gone there. Hurrying back to Laird's office, Chan informs the doctor that analysis of the pills he had found at van Boorman's home proves that they are stimulants rather than tranquillizers, and that this would have only served to worsen van Boorman's condition. After leaving Laird's office, Barry tells Chan that he memorized the information, written in Latin, on the prescription he had found in Laird's office. Upon analysis, this information confirms that the Doctor had indeed prescribed tranquillizing pills for van Boorman. Further questioning of Mrs. Van Boorman by Charlie Chan proves that her previous statements were fabrications meant to protect Dr. Laird with whom she admitted she was in love as her current marriage to van Boorman was going bad. Informed that Weber could be found at his sister's house, Chan goes there, finding Miss Weber alone. She tells the detective that her brother is very ill and is under the care of a Dr. Krause, a fellow Hollander. At Krauses' office, Chan hears that the doctor, who has cared for Weber for years, recently prescribed stimulants to combat his complaints of a lack of energy. Hearing that Bert Conway has just been released from jail, Chan and Barry hurry over to van Boorman's residence in time to stop Conway from making good on his threats against Weber. Inspector Duff arrives in time to hear Chan accuse Weber of being the one who switched van Boorman's tranquillizing medicine the stimulant pills he had received from Dr. Krause. Krause counters by accusing van Boorman of being a Nazi traitor in Holland during the war. The truth is that van Boorman was a British informant and it was actually Weber who was the Nazi sympathizer. Although he had not stolen the diamond, Weber had given van Boorman the drugs in order to stop him from working on the diamond, so that Kirk would have time to return home from college and steal the diamond to feed his extravagant tastes. A telephone call reveals that Mr. von Boorman has come out of his coma. Mrs. Van Boorman states that her affair with Dr. Laird is over and that she will not be leaving her husband. Patience can be likened to sleeping flower; cultivate same, and it will reward you handsomely. One does not solve crime by committing another. Ways of a woman in love were never born in cradle of logic. Good news follows bad news like day follows night.